Sunday, May 25th: Stuff To Remember, Stuff To Grill, Localicious Stuff… and STRAWBERRIES & CHERRIES! Fresh smoked king salmon from Wilson Fish. Photo copyright 2009 by Zachary D. Lyons. It is Memorial Day Weekend, a time that is supposed to be set aside for reflection and remembrance, that we never forget those who made the ultimate sacrifice for our nation. But Memorial Day didn’t always have a Weekend. It didn’t used to be on a Monday, so that folks could easily go camping, and stores could easily offer weekend-long sales. No, Memorial Day used to be held on May 30th, regardless of the day of the week, as proclaimed on 5 May 1868 by General John Logan, national commander of the Grand Army of the Republic, in his General Order No. 11, to recognize all those lost during the Civil War. It was not until the passage by Congress of the National Holiday Act of 1971 that Memorial Day was moved to the last Monday in May. But for me, growing up, I always thought that the big parade down Main Street in New Paltz, New York every May 30th was to celebrate my mom’s birthday. And ever since the holiday was moved to a Monday, I have struggled to remember when my mother’s birthday is. I write this to remind us all why we get Monday off this week, and to remind myself to call my mom on Friday! Oh, and Wilson Fish has tweaked their smoked king salmon recipe ever-so-slightly, meaning that now, the best smoked king salmon around is even better! Get some… to nibble on while you’re at the parade tomorrow, of course. Strawberries from Hayton Berry Farms. Photo copyright 2013 by Zachary D. Lyons. This just in: Hayton Berry Farms returns today for the 2014 season with their first harvest of strawberries! Woohoo!!! Finally, a crop that came on early this year! Mariah Doty from Nash’s Organic Produce. Photo courtesy Nash’s Organic Produce. This is Mariah from Nash’s Organic Produce. She’s been selling for them at your Ballard Farmers Market for like a hundred years… or seven. One of those, anyway. Well, tomorrow is her last day. Stop by, bid her adieu, and grab some of their Spinach and some of their own freshly-milled Corn Meal, too! Red Russian kale from One Leaf Farm. Photo copyright 2014 by Zachary D. Lyons. One Leaf Farm has lots of lovely, tender spring greens coming on right now, from pac choi to broccolini raab, with a flavor akin to turnip greens, to this gorgeous red Russian kale that is great raw, or just barely wilted, maybe tossed with some sautéed green garlic. Mmm. First-of-the-season Burlat cherries from Lyall Farms. Photo copyright 2013 by Zachary D. Lyons. LATE BREAKING NEWS: Lyall Farms will have the first cherries of the season today at your Ballard Farmers Market! These early Burlat cherries are the first cherry to ripen, and Lyall’s orchards in Prosser are perfectly located to produce the first of these cherries each year! Salad mix from Growing Things Farm. Photo copyright 2012 by Zachary D. Lyons. Meet salad mix from Growing Things Farm. It is a lovely, delicate mix of a variety of greens, all harvested very young. It makes for a wonderful, and simple, salad for any day of the week. Sausage from Skagit River Ranch. Photo copyright 2012 by Zachary D. Lyons. Looking for some yummy sausages to grill up tomorrow? Skagit River Ranch has a great selection of them for you to enjoy, from bratwurst to hot dogs to hot Italian to a sweet Italian sausage link that will please any ex-pat New Yorker! Green onions from Children’s Garden. Photo copyright 2013 by Zachary D. Lyons. Mea culpa. I forgot to include Children’s Garden in last week’s tribute to the many Ballard Farmers Market vendors who contributed ingredients to our May 13th Fresh Bucks fundraiser. They provided their beautiful herbs, including cilantro, chives and these gorgeous green onions, great for so many applications. Try grilling them, for instance! Organic asparagus from Alvarez Organic Farms. Photo copyright 2011 by Zachary D. Lyons. Organic asparagus from Alvarez Organic Farms is great grilled, too. Nuff said. Red radishes from Oxbow Farm. Photo copyright 2014 by Zachary D. Lyons. Oxbow Farm rejoined us earlier this month for the 2014 season. They’ve got lots of their great tomato plants right now, ready for your garden, as well as lovage, oregano, these red radishes and much more! Fresh sheep’s milk yogurt from Glendale Shepherd. Photo courtesy Glendale Shepherd. Some fresh sheep’s milk yogurt from Glendale Shepherd is a nice compliment to some of those Hayton strawberries, incorporated into any number of recipes, or just on its own, as I like to enjoy it. Hand-forged blue steele pans from Blu Skillet. Photo copyright 2013 by Zachary D. Lyons. One more vendor from your Ballard Farmers Market that contributed to our Fresh Bucks fundraiser is Blu Skillet Ironware, which donated one of their beautiful forged iron pans to the live auction… a pan won by Farmer George of Skagit River Ranch! You know, I use one of their 10″ skillets as my go-to pan. It is amazing, gorgeous, competitively priced for the quality that you get, and it is made in Ballard! Sunday, April 27th: Not A Holiday! Just Another Day Of Great Localiciousness! Chef Jason Stoneburner of Stoneburner Restaurant. Photo courtesy Stoneburner Restaurant. Have you gotten your ticket to the best party this spring? If not, hurry, cuz supplies are limited. And dinner alone is worth the price of admission! 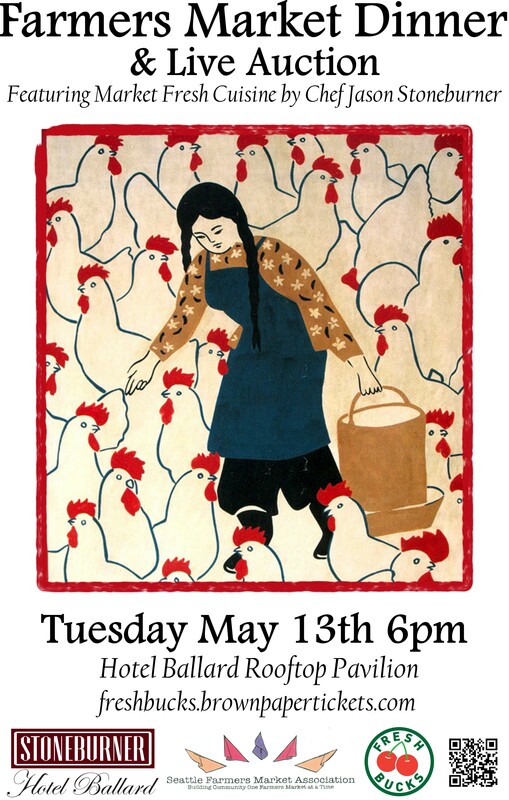 I’m talking about the Farmers Market Dinner & Auction to Support Fresh Bucks, and it is happening in the Rooftop Pavilion of Hotel Ballard on Tuesday, May 13th. Chef Jason Stoneburner and his crew will be laying out a fabulous spread using ingredients from your Ballard Farmers Market, and the auction will feature food experiences, getaways, fine dining and art, and more, from places like Ray’s Boathouse, the NW Chocolate Festival, Taylor Shellfish, Cedarbrook Lodge, and even three nights in a beautiful house on Fresh Water Bay, west of Port Angeles! All to support our Fresh Bucks program. You get fun, deliciousness and goodies. Local families of limited means get greater access to the same great local food we enjoy here at your Ballard Farmers Market every Sunday! Buy your tickets now, or simply donate, if you cannot attend. Tom Thumb lettuce from One Leaf Farm. Photo copyright 2013 by Zachary D. Lyons. We start our tour of what’s fresh this week under the heading of “Friggin’ Adorable Produce.” This is Tom Thumb lettuce from One Leaf Farm. One Leaf grows a wonderful variety of heirloom lettuces. This one is a tiny variety of butterhead lettuce that is about the size of a baseball when mature. A single head is perfect for one salad. So stop by One Leaf, and get your lettuce on, cuz lettuce is back, baby! Farmer Jessie Hopkins of Colinwood Farms holding baby zucchini with blossoms. Photo copyright 2013 by Zachary D. Lyons. And speaking of adorable produce, how’s about these tiny baby summer squash from Colinwood Farm. That’s them, right there, in Jessie’s hands. They come with blossoms attached this time of year, and they are perfect for a quick sauté or tossed into a salad. How many months has it been since you had your last local summer squash? Nuff said. Fresh Hood Canal Spot Prawns from Hama Hama Oyster Company. Photo courtesy Hama Hama Oyster Company. Once a year, if we’re lucky, Hood Canal is opened for spot prawns. This is that time! Today, at your Ballard Farmers market, Hama Hama Oyster Company will have a limited supply of the finest shrimp on earth, our own native spot prawns (which, BTW, are not prawns, but shrimp). Come get them while you can, but get here early, as they will go very, very quickly! Spring onions from Magana Farms. Photo copyright 2010 by Zachary D. Lyons. Hopefully, we will see some of these wonderful spring sweet onions from Magana Farms today. As of last week, they were apparently right on the brink of readiness for market, so let’s hope so. They are great grilled or roasted with some of Magana’s asparagus! Radishes from Alm Hill Gardens. Photo copyright 2014 by Zachary D. Lyons. Andrey is psyched to enjoy his Loki Fish salmon sliders. Photo copyright 2014 by Zachary D. Lyons. Andrey is psyched. And can you blame him? He’s got a plate of Loki Fish Salmon Sliders hot off the grill. Booyah! Made using Loki’s own fish, rolls made with Washington flour, and local veggies and bacon for toppings, they are like one adorable, delicious bite of the Market, yo! But they keep running out of them early each week, despite bringing more and more, so get them early. Gary Howell leading the goats out into the pasture at Twin Oaks Creamery in Chehalis. Photo copyright 2013 by Zachary D. Lyons. And we finish this week’s tale of all things (or at least several things) adorable at your Ballard Farmers Market with this photo of adorable dairy goats following Gary out of the barn and onto the pasture at Twin Oaks Creamery. These hardworking, and rambunctious, critters eat well, play well, live well, and produce amazing milk that Twin Oaks bottles, and makes into chevre, feta, aged cheeses, yogurt and more! Yeah, baby! Sunday, April 20th: Farmers Market Dinner & Auction, and More Farmers Return! Radishes from Stoney Plains Organic Farm. Photo copyright 2013 by Zachary D. Lyons. Well, after a winter of Sundays dominated by either bad weather or Seahawks games, we welcome the fifth straight Sunday in a row of lovely spring weather at your Ballard Farmers Market. And with this gorgeousness comes more and more spring produce. Like more radishes from Stoney Plains Organic Farm! I have been going radish crazy for the last couple of weeks, after months living without them. And hey, maybe your Easter egg hunt got rained out yesterday, but today, you can enjoy some wonderful Easter egg radishes (top left of photo, above). Enjoy! It’s asparagus time again! Photo copyright 2011 by Zachary D. Lyons. And more asparagus! Yes, our friends at Magana Farms return today after their winter hiatus, meaning we now have three farms with asparagus at your Ballard Farmers Market. I suspect they may also bring with them some spring onions, too, if they are true to past history. Fresh Herbs de Provence & Garlic-Parsley Chevre in new packaging from Twin Oaks Creamery. Photo copyright 2013 by Zachary D. Lyons. Twin Oaks Creamery from Chehalis returns today with all sorts of cow’s milk and goat’s milk deliciousness. You’ll find fresh, pasteurized, bottled cow’s milk, fresh chevre (goat cheese), cheese curds (cow cheese), goat yogurt, goat feta and likely some aged raw milk cheeses. Woohoo! Over-Wintered Cauliflower in the field in Sequim from Nash’s Organic Produce. Photo copyright 2010 by Zachary D. Lyons. Over-wintered cauliflower is in the house! Go Nash’s! It’s your birthday! Go Nash’s! It’s your birthday! (Sorry. Lost it a bit there.) This image is, in fact, cauliflower in the field at Nash’s Organic Produce. And when it’s made it through a tough winter, it is oh, so sweet now! They’ve also got a bunch of over-wintered leeks today, too. And I hear they are sending me a recipe to make some awesome soup with the two, so stay tuned. Camelina oil is back today at your Ballard Farmers Market. Produced by Ole World Oils on their farm yonder in Ritzville, this is your local cooking oil. It has a very high smoke point (475 degrees), is high in beneficial omega-fatty acids, with a perfect 2:1 omega-3 to omega-6 ratio, and it is stable, so you don’t need to refrigerate it. It has a wonderful, nutty flavor great for both cooking and as a finishing oil. And I love tossing cauliflower in it and roasting it in a 425 degree oven until just fork tender. The flavors compliment each other well. And best of all, it is priced competitively with olive oil. Early spring rhubarb from Alm Hill Gardens. Photo copyright 2013 by Zachary D. Lyons. There is still plenty of time to crank out your first rhubarb crumble of the season before the rest of the family shows up for Easter supper. Just grab some of this fresh rhubarb from Alm Hill Gardens today, and go home and get your crumble on! Just get here early, both because it will sell out, and because it will lower your stress level whilst making your holiday feast. Freshly smoked ham from Sea Breeze Farm. Photo copyright 2013 by Zachary D. Lyons. Looking for that last-minute Easter ham? Stop by Sea Breeze Farm! They will have plenty today… depending on your definition of “plenty.” Of course, if you are the slacker that rolls in after 2 p.m. today looking for it, you might find that our definition of plenty and yours are at odds. Oh, they will have some fresh lamb today, too! When you think about Belgian ales, you think of monks, right? And besides making great beer, what else do Belgian monks do? That’s right! They practice Catholicism. And since this is Easter Sunday, it only follows that you should grab a bottle or three of this holy beverage from our newest vendor, and our first-ever brewery, Propolis Brewing, from Port Townsend. Using malted Washington grains and many local, seasonal ingredients to give each variety its unique flavor, this is the first brewery to qualify to sell at your Ballard Farmers Market, because we actually require all of our alcoholic beverage producers to use at least 95% Washington-grown ingredients. Enjoy! Easter kugelhopf from Tall Grass Bakery. Photo copyright 2011 by Zachary D. Lyons. This is Easter kugelhopf from Tall Grass Bakery. “This rich buttery flavored golden coffee cake with a rich, buttery flavor is named after the pan with which it is made-kugelhopf pan,” says iFood.tv on its list of the top 10 Easter breads. (Who knew?) It is a German specialty bread, and our friends at Tall Grass Bakery make it extra special. Plus, they will have some hot cross buns (#2 on the list. Kugelhopf is #1.) today, too, and maybe a few other surprises to round out your Easter festivities. A happy child at Whidbey Island Ice Cream. Photo copyright 2010 by Zachary D. Lyons. Hey, kids (young and old)! Whidbey Island Ice Cream is back at your Ballard Farmers Market! Boy Howdy!!! 2013 was kind of a roller coaster for them, but they’ve settled into their new production facility, and it is time again to get our ice cream on, folks. I scream, you scream, we all scream for ice cream! Easter fun from Olsen Farms. Photo copyright 2012 by Zachary D. Lyons. We’ll finish this week’s epistle — not a Papal epistle, but a farmers market epistle — with this lovely image of Easter’s past from our buddies at Olsen Farms. These are their Easter potato bunnies surrounded by Easter potato eggs. And if you need spuds still for today’s Easter feast, they’ve got those, too. As well as a bunch of freshly smoked hams!